Lately I’ve been slightly obsessed with making super nourishing foods, mainly soups. 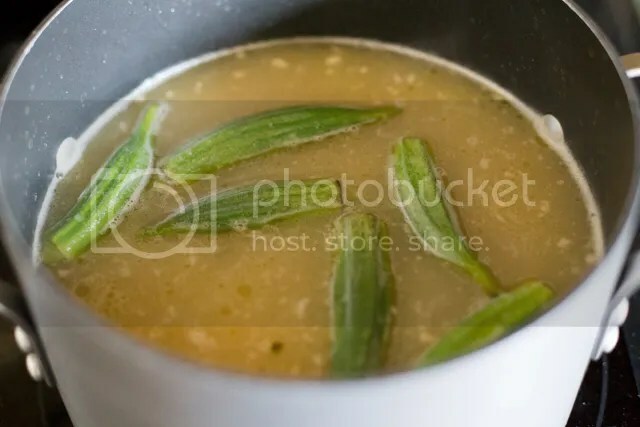 Turns out that many soups that are considered miracle meals (often affectionately termed “hangover meals”) – Pho, Attukal Paya, or even a simple chicken soup – basically consist of boiling soup bones for extended periods of time and adding spices as needed. So to add to my growing list of nourishing soups, I present Cow Heel Soup. 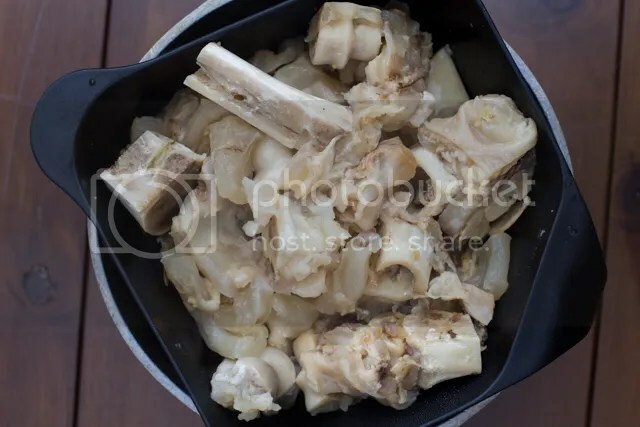 Also known as Cow Foot or Bull Foot Soup, Cow Heel Soup is a traditional soup found in the Caribbean (mainly Jamaica, Trinidad, and Tobago). Legend has it that in the 18th century, plantation owners would take the best cuts of cows and leave the workers with the “fifth quarter” – tail, feet, head, and organs – which became quite a challenge for local cooks. 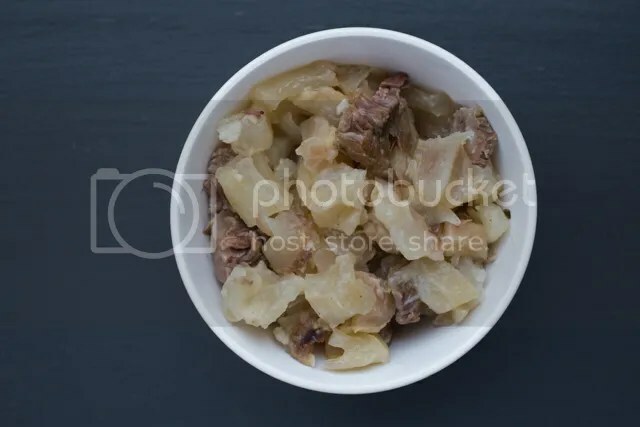 Over time the recipe for cow heel soup became popular, and while there are many variations to this dish, I tried to keep my recipe close to the standard, baseline recipe. 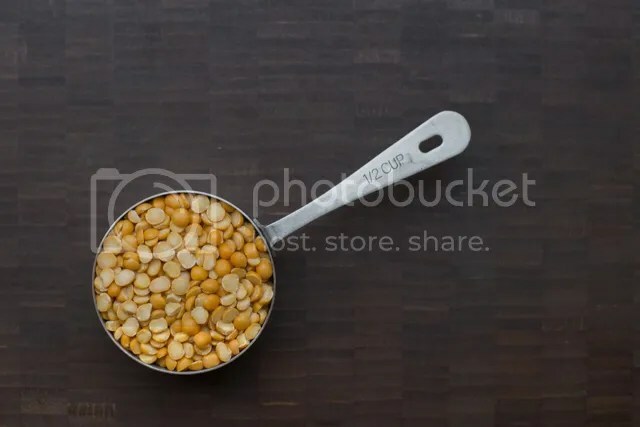 Traditionally, this soup is made with split yellow peas. While peas in many forms (mostly those eaten in the pod) have been given the green light by many Paleo gurus, you may want to consider soaking them overnight to make them more digestible. The night before your big cooking adventure, soak your split peas in water (cover the bowl with a paper towel), then rinse thoroughly before using. If you’re concerned about whether to use them, omitting them isn’t the end of the world – your soup may just be a little thin (not a tragedy by any means). Okay, let’s make the soup now. Broil your bones in the oven for 15 minutes, until browned. In a large stockpot, heat up the butter or ghee on med/low heat for a minute or two, then add the onion and thyme. Sauté until soft, about five minutes. Once the onion is soft, add the garlic and sauté for another minute, then add the bones and a bay leaf. Fill with enough water to cover the bones by about an inch, then bring to a boil and simmer for two hours. Adjust the heat to maintain a gentle (not rolling) boil, somewhere between low and med/low heat. Skim off fat and scum as it accumulates on top of the soup. Next, add the split peas and whole scotch bonnet (or habanero) pepper, and simmer for two more hours. 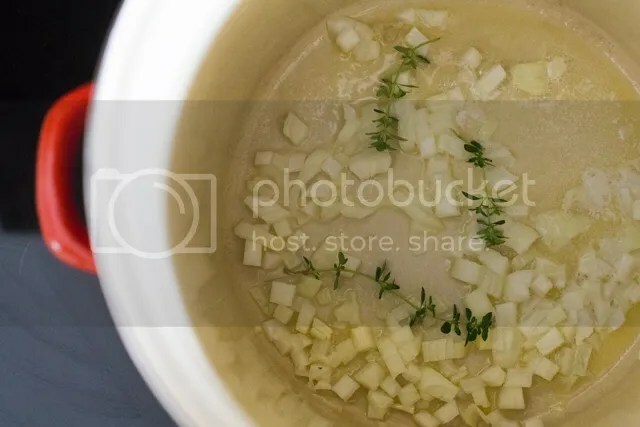 The peas will dissolve and thicken the soup, and the pepper will float on top and be slightly annoying while imparting a little flavor into the soup. After the four total hours of simmering, the bones should be ready to go. Fish them out of the soup and set them in a colander to strain and cool. Also, fish out the bay leaf, thyme, and pepper and discard. Next, add the carrots, potatoes, and okra and gently simmer until softened, about 25-30 minutes. 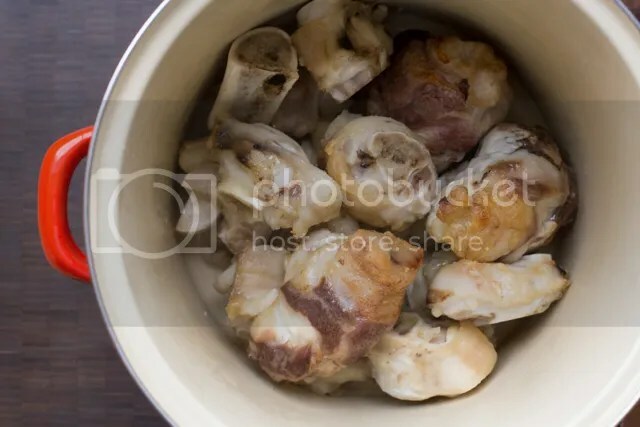 Once the bones are cool to the touch, remove the cartilage and meat from the bones and cut into bite-sized chunks. 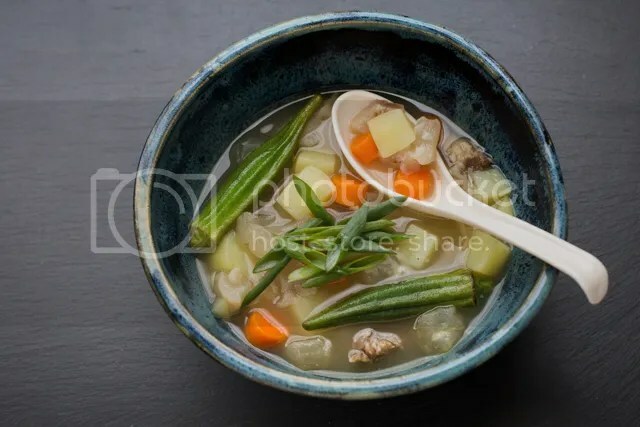 Once the veggies are soft, add the cartilage and meat to the soup and let it warm up for a minute, season to taste (about 1/2 tsp each salt and pepper), and serve. Garnish with sliced scallions. Glad to see someone else having a crack at cow feet, though your presentation is far superior! This looks gorgeous! I was just thinking of the heavenly ramen I had last weekend when your post turned up in front of me. I love a good, flavorful broth! Yum! I love making bone broths but never roasted the bones first. Do you think it changes the taste much? 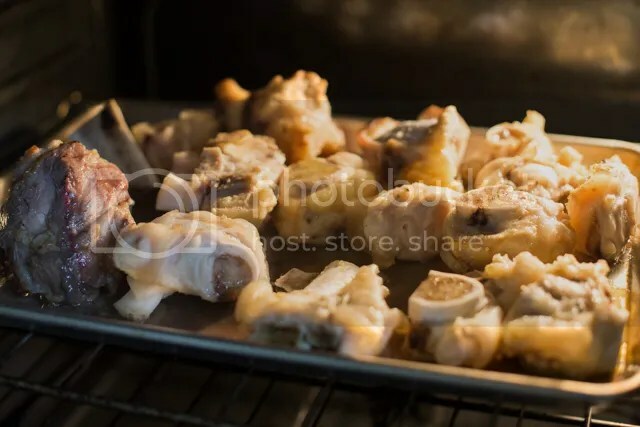 Hi Lauren, I think that roasting bone is important for nearly all bone broths, as it adds a much deeper and most palatable taste to the broth overall. I do the same for my beef stock if using uncooked soup bones. I didn’t know cartilage was edible, isn’t it hard to chew? Very interesting. Great to see you like onions. :) Where did you find the Scotch Bonnet Pepper? I have a delicious hot sauce made by Lou’s Savory Sauces, made from Scotch Bonnet Pepper. I’ve never seen them for sale out here on the West Coast. I made this cow heel soup, and it was delicious. I was pleasantly surprised by the knuckle cartilage flavor and texture. We will eat it for leftovers tonight. I nicknamed it knuckle soup, because I find it funny, like a knuckle sandwich. Thanks domestic man! Awesome, glad you guys liked it! It’s a very rewarding soup. Wow – takes me back to my childhood (my family is Guyanese). I might have to try making this, although my New Hampshire-born, food-squeamish wife will almost certainly have nothing to do with it. 😂😂😂😂😂 don’t know what she missing! Pingback: Caribbean Eats! Cow Heel Soup – Trinidad and Tobago | Caribbean Eats! I made an expanded version of this using eddoes instead of potatoes. My cow heel soup also included tripe, beef neck bones, barley, green plantains, a tablespoon of whole black pepper and shiitake mushrooms. Incidentally, Simon, a commenter above…..I’m his Mum.